Thousands of cells develop before any recognizable form of life takes shape. Humans have more than 10 trillion cells, and the number of cells in plants and animals vary species to species. The journey an individual cell takes when determining what to become is an adventure that many scientists follow closely. CSUN students attended the Society for the Advancement of Chicano and Native American’s 2017 National Diversity in Science, Technology, Engineering and Math conference. Students in the back, from left to right are: Dustin Hyde-Bozer and Aria Javidan. Students in the front from left to right are: Subrajaa Manohar, Camilo Echeverria and Alexis Avila. Photo credit: Crystal Rogers. California State University, Northridge biotechnology senior Camilo Echeverria was honored at the 2017 National Diversity in Science, Technology, Engineering and Math conference for his project, “Creating a Toolkit for Multi-Vertebrate Biochemical Analysis,” which uses bioinformatics — a tool for understanding biological data that uses protein sequences to spot the similarities in proteins in different organisms. 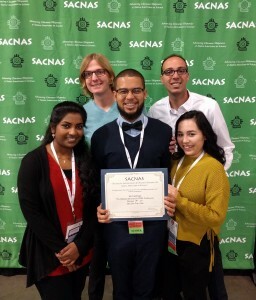 At the conference, Echeverria received a research presentation award for the Society for the Advancement of Chicanos and Native American Students. The project uses a “western blot” — a popular analytical technique used in molecular biology to detect specific proteins — to find antibodies that may recognize proteins from multiple organisms, to help the biology community. Echeverria’s partner on the project was CSUN biology senior Brandon Harding. The findings from the students’ projects could help scientists further understand developmental defects, such as cleft palate, albinism and central nervous system problems. Cells decide what they are going to be at an early embryonic stage. The neural crest cells develop into facial cartilage and bone, smooth muscle, skin pigment and the peripheral nervous system, Rogers said. “The major goal is to determine how neural crest cells, neural ectoderm and non-neural ectoderm separate in different people and organisms,” she said. To answer that question, Echeverria and Harding used a gene overexpression, an experimental technique in which the expression of one or more of an organism’s genes are increased. Echeverria injected the embryos of axolotl and chickens with DNA-encoding-specific genes to modify gene expression and identify the consequences. Echeverria and Harding’s project was funded by the Eunice Kennedy Shriver National Institute of Child Health and Human Development with a grant of $435,000 to Rogers, to investigate cadherin proteins — a calcium-dependent cell-adhesion molecule, proteins located on the cell surface involved in binding with other cells, and type-one transmembrane protein in early embryonic development. The goal is to determine the role that adhesion molecules play in a cell — the basic structure, function and biological unit of living organisms — in early development. Rogers used the grant funds to support six CSUN student studies as they explore the question. “We really want to know the signals that are involved and the different molecular pathways that control how [an] abnormal cell knows it’s going to become part of the brain or how abnormal crest cells migrate,” Rogers said. Neural crest cells are transient groups of cells that develop from the embryonic ectoderm, which is the outmost layer of an embryo. These cell groups are unique to vertebrates. The other five grant-funded studies in Rogers’ group are: “The Role of Cadherin-11 in Neural Crest Cell Specification and Survival,” by cell and molecular biology alumnus Alberto Camacho and biotechnology graduating senior Subrajaa Manohar; “The Role for Cadherin-7 in Cranial Neural Crest Specification,” by biochemistry senior Aria Javidan and molecular biology senior Dustin Hyde-Bozer; “A Precise Balance Between Ncad and Ecad Regulates Neuro Ectodermal Cell Fate,” by biology graduate student Lisa Sorrells Smith; and “Species-Specific Roles of Sox10, the Neural Crest Gene Regulatory Network,” by medical technology senior Alexis Camacho-Avila and psychology senior Kathleen Perera.